A young boy decides it is time to buy a new pair of socks to replace the smelly one's he's worn for three years. He travels to town via the swamp discovering items he's lots along the way. He encounters an alligator and a chase ensues. The alligator gets hold of the boys' shoe and when the shoe cocmes off, the odor from the socks, stuns the alligator. The boy continues on his way to buy new socks. With each step along his journey, he experiences an adverbial action. 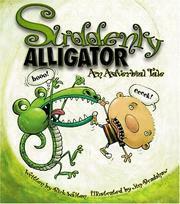 Walton, Rick, “Suddenly alligator: An adverbial tale,” Children's Picture Book Database at Miami University, accessed April 25, 2019, https://dlp.lib.miamioh.edu/picturebook/items/show/13769.